My thesis is that argumentation, as formulated in speech, is based on scalar principles. Everything that I have said supposes a clear-cut distinction between reasoning and argumentation, and as a linguist, what I am interested in is what goes on in speech, not what goes on in people’s heads… From the logical point of view, the policeman does not need to rely on a scalar principle but once he opens his mouth, he injects scalarity into things, which in themselves have none. Scalarity is a constraint which speech imposes upon us (Ducrot 1996: 162; all italics are mine). The thesis referred to in the quote is not mine, but the one Oswald Ducrot advocates (I do agree with it, though). But before it gets us to the distinction between what goes on in speech and what goes on in people’s heads, let us have a look at this policeman story, briefly mentioned in the quote. Let us suppose, for example, that someone has been murdered, even here say, at four thirty, and that he has been stabbed to death (a very important detail for my demonstration). The culprit is being looked for and the police suspect a certain French linguist who is presently in Ljubljana: that linguist had reasons to resent his victim, who had been very unpleasant about the theory of argumentation in general and about scalarity in particular; moreover, the wound could very well have been made with the dagger which that linguist usually has in his luggage. At that moment of the inquiry, a new piece of information reaches the police: the information that at four thirty, the time of the crime, the French linguist was at his hotel and obviously could not have stabbed someone here. In virtue of the following argument, he is found not guilty: ‘It cannot be him, as he was at his hotel at four thirty’. Such an example does seem to show that the principles which arguments rest upon are not necessarily scalar. In that case, the argument rests on a principle according to which When a person is not in a place, he cannot do anything there, and there seems to be nothing scalar about that principle at all. That is the first part of Ducrot’s argument, the part that usually passes without objections. Probably because, in a way, Ducrot is just remodelling or restructuring Stephen Toulmin’s (1958/1995: 94-107) argumentative model, where the transition from an argument (data in Toulmin’s terminology) to a conclusion (claim in Toulmin’s terminology) is based on a topos (warrant in Toulmin’s terminology). To do justice to the history of rhetoric and argumentation we have to add that Toulmin himself is actually just reconstructing Quintilian’s theory of enthymeme where one of the premises (usually the major one, but not necessarily) – that is kept implicit or not spoken out explicitely because it is presumed that it is shared by the speaker and the addressee – warrants the transition from the other premise to the conclusion. And to be absolutely honest about Toulmin’s model of argumentation, we have to add that his complex pattern or complex layout of argument (1958/1995: 101-104) is conceptually very similar to an elaborated epicheireme, a developed and justified enthymeme, presumably attrubuted to Aristotel’s pupil Teofrastes(ii). We are going back to the same situation. Well, the police have just received the information that at four thirty, the linguist was at his hotel. Then, all of a sudden, some more information reaches them according to which in fact, the linguist was not at his hotel but much further from the place of the crime, for example that he was visiting a castle situated out of the town in the country. Now, having said ‘At four thirty, he was at his hotel’, a policeman may very well say to correct what he has just said: ‘In fact, he was even visiting the castle’.I think that the policeman would really tend to use an even to correct the firts piece of information. Now, remember my description of even. I say that even relates two arguments moving towards a common conclusion, the second argument being represented as more forceful than the first. So, ‘He was at the castle’ is a more forceful argument than ‘He was at the hotel’ for the conclusion aimed at (‘He is not guilty’).Why more forceful? If it is a more forceful argument, it is because the topos which the policeman was using was not When a person is not in a place, he cannot do anything there but rather The further a person is from a place, the lesser he can do something there, so that the linguist being in the castle at the material time, he was even less likely to have committed the murder than if he had been at the hotel. This is Ducrot’s thesis that is still under constant attack, even more than his and Anscombre’s theory of polyphony that finally managed to gaine some respect (though more among linguists than among argumentation theorists). The standard objection to this scalarity-in-speech (representation) thesis, an objection I had to answer to many times myself is: ‘This is completely artificial. The human mind doesn’t reason that way at all’. No (counter)-arguments were given, though. But, is it really so? Is it true that human mind doesn’t reason that way? Let us have a look at a few everyday situations – real this time, not made up. 1. A few more centimetres to the left, and it could have been fatal! What have you got to go on? 1.b Datum (Argument) – If he fell a few more centimetres to the left, it could have been fatal. 1.c Warrant (Topos) – Closer to a dangerous place one falls, worse the fall is. Let’s sum up what really happened: the kid fell. He only got a light bruise. But since there was a dangerous hole in a rock close by, his fall was evaluated as a very dangerous one, and the whole argumentation put in the scalar form. What was going on in my wife’s head when she uttered (1) (or a few moments before that), I don’t know and it is not really important: I understood her argument perfectly. I mean: sure, it would be interesting to know how and in what way the mind formulates the arguments. But since they are (i.e. when they are, which is not always the case) formulated and represented as scalar, that is completely sufficient for our understanding of them, our evaluation, and (potential) action/re-action (if needed). II. You probably remember a similar exchange yourself, be it from everyday life, media or somewhere else. It doesn’t really matter; what matters is that people obviously use it and understand it as a possible and valid form of argumentation. A (comming home): What’s for lunch? A: Chicken? I could eat a horse! 2.a Claim (Conclusion) – I am very hungry. 2.b Datum (Argument) – I could eat not only a chicken, but a horse. 2.c Warrant (Topos) – More hungry you are, more you can eat. But that may seem too trivial (though argumentation, permeating all everyday activities, can be trivial). Let us have a look at a scene that took place a few years ago at a Christmas dinner (a scene that is actually very similar to the famous scene from Monthy Python’s The Meaning of Life). 3. A (stuffing himself with food): Another chocolate cookie, and I’ll blow up! 3.a Claim (Conclusion) – I am (more than) full. 3.b Datum (Argument) – I can not eat another cookie. 3.c Warrant (Topos) – More you eat, less it is needed to be full. 4. Then you are not Slovenian enough. 4.a Claim (Conclusion) – You are not not Slovenian enough. 4.b Datum (Argument) – You don’t like the Slovenian popular ethnic music. 4.c Warrant (Topos) – More you like the Slovenian popular ethnic music, more you are Slovenian. The usual objection to scalarity claims that topoi or warrants shouldn’t be formulated in scalar form, but rather causally (If P then Q). But such a formulation wouldn’t always warrant the conclusion: the person I was talking to didn’t say I wasn’t Slovenian at all (he knew he couldn’t substantiate such a claim), he said I wasn’t Slovenian enough. According to his argumentation, people listening to the beef music are more Slovenian than people who don’t. Also, in our second example, a warrant of the form ‘If you are hungry, you have to eat’ wouldn’t adequatly explain the situation. The person in question didn’t simply say he was hungry, he said he was very hungry, so hungry that just a chicken wouldn’t be enough. But, as already mentioned, Toulmin didn’t stop at this simple (even simplified) model, but constructed a much more complex model as well. Looking at his simple model, one could assume that the warrant is an absolute rule to which there are no exceptions. But, of course, such a rule, a rule that stays implicit, can not be universal, which means that in the model we have to make place for exceptions (rebuttal in Toulmin’s terms), that the claim may have to be weakend by means of a qualifier, and that the warrant itself may need some backing. And if we apply this extended model to our scalar examples, we see immediately that, though it may be perfectly clear what the language is telling us, it is much less clear what is going on in the mind at the same time. 1.c Closer to a dangerous place one falls, worse it is. 5. Thank God! He’s OK! 5.a Claim (Conclusion) – Thank God! He’s OK! 5.b Datum (Argument) – If he fell a few more centimetres to the left, it could have been fatal. 5.c Warrant (Topos) – Closer to a dangerous place one falls, worse it is. Instead of going for the ‘negative’ conclusion as in 1a (The kid took a nasty fall), the mother argued for the ‘positive’ one (He’s OK! ), a conclusion that actually implies the ‘negative’ one, and makes sense only if we realize how nasty the fall could have been if the kid fell a few centimetres to the left. So, the processing of information(s) might have been different, but the wording of the argument(ation) remains scalar. 1,5.d No, but it is often seen (or felt) as such. In reality, falling close to a dangerous place is nothing serious. 1,5.e No, it is only often felt as such. 1,5.f Obviously, our mind processes the given data in the way that makes it seem that way/us feel that way. Which that way is, or what exactley that processing consists of, we don’t really know. We are bound to the argumentation we hear, not to the argumentation as it (supposedly) unfolds in our heads. And the argumentation we hear appears to be scalar, in our case even more than that: we are confronted with one and the same argument (1,5.b) yielding two (seemingly) opposite conclusions (1,5.a). 2.a I am very hungry (Argument) > 2.b I could eat not only a chicken, but a horse (Conclusion). 3.a I am (more than) full! (Argument) > 3.b I can not eat yet another cookie (Conclusion). The only difference between both two versions is that the conclusion of the ‘original’ version could (also) be taken as an implicature (i.e., implicit, not spoken out) – the ‘original’ version thus becoming an enthymeme with the missing major premise and the missing conclusion – while the conclusion of the reversed version could (probably) not (featuring such particular items as ‘chicken’, ‘horse’, and ‘cookie’, it is (probably) not general enough). Everything else, including the warrant, stays the same. 7. It’s warm, but I’m tired. Such an answer can clearly be understood as a refusal: in the first part of the argument, I did agree that it was warm, thus agreeing with my interlocutor that warm weather is a good (acceptable, sufficient, …) argument for suggesting a walk. But in the second part of the argument I argued that I was tired, which was understood as a stronger argument, overriding the first one, and thus rejecting the offer for a walk. But, why was the second argument felt as a stronger one: because tiredness is considered a stronger argument than warmness, or was it, maybe, because of the order of arguments? 7′ I’m tired, but it’s warm. we can only conclude in the direction of Let’s go for a walk (argument It is warm, warranted by If it is warm, it is pleasant to walk, overriding the argument I’m tired, warranted by If we are tired, it is not pleasant to walk), and not the other way round. 1. 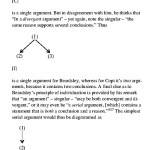 Argumentation always comes in blocks, consisting of an argument (at least one) and a conclusion, and that we always have to consider them together, in relation to one another. As we saw from our initial example (1), there is no absolute and independant orientation an argument can have: it is always limited, explained, and interpreted by the conclusion. And one and the same argument can have (at least?) two different, even opposite, conclusions (whether that really makes it the same argument is a topic for another paper). Therefore, when assessing and evaluating an argument, we always have to do it in relation to the conclusion reached, within the framework of a given topic, never in isolation. 2. Which, again, raises an interesting question: does language dominate our cognition or is it our cognition that dominates language? Namely, if the extra-linguistic reality (e.g. the hole in the rock, the fall, …) stays the same, how come that one and the same argument, describing this reality, can lead to two opposite conclusions? My fumbling answer would be that this ‘extra-linguistic’ reality is never given as such, as it is per se (if there is anything per se at all), but always as already mediated and represented in language.We can only understand this ‘extra-linguistic reality’ through language, and as it is represented in language (which, of course, cancels its ‘extra-linguistic’ status), we don’t understand it in some unknown and unintelligible way, and only then translate it into language. And since reality is (in) the language, and the language is reality, we can manipulate reality as we manipulate language.The problem, however, remains, whether by manipulating reality as (we manipulate) language, we work out everything there is of reality? And, furthermore, if there are any doubts about that (and there should be, at least from the methodological and epistemological point of view), whether we really know what we are doing all the way? We may know what we are doing when we manipulate language (though the major part of our linguistic choices is done unconciously), but do we really know what are the effects of this manipulation in the reality, and on the reality (as existing beyond language)? An old Kantian (or even pre-Kantian) problem that still needs to be resolved to general satisfaction. i. For more about this subject, cf. my presentation at the previous ISSA conference (Zagar 1999: 909-912). ii. A completely opposite view on this matter was presented in David Hitchcock’s contribution Toulmin’s Warrants (somewhere in these Proceedings). The fact that the warrant finds itself below the datum and the claim indicates that it is implicit, not spoken out in the process of argumentation. Toulmin, S.E. (1958/1995). The Uses of Argument. Cambridge: Cambridge University Press. Zagar, I. Z. (1999). From Topos to Locus to Topos: Between Aristotle and Ducrot. In: F.H. van Eemeran, R. Grootendorst, J.A. Blair, Ch. A. Willard (eds. ), Proceedings of the Fourth International Conference of the International Society for the Study of Argumentation (pp. 909 – 912), Amsterdam: Sic Sat. Ducrot, O. (1996). Slovenian Lectures/Conférences Slovénès, Ljubljana: ISH. What is 8 + 16 ?